With little warning and little fanfare, Konami this week released a new picross game for mobile that is both very, very good and very, very free. 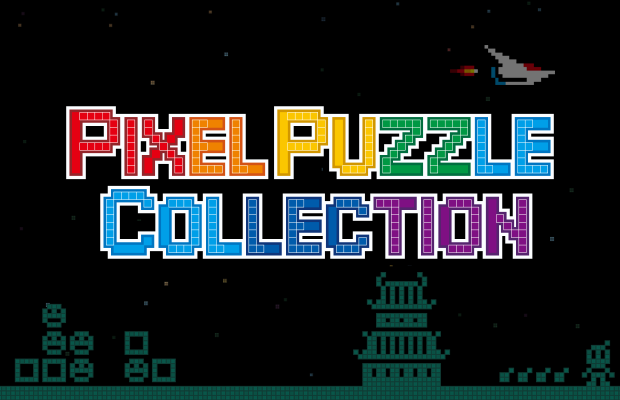 It’s called Pixel Puzzle Collection, it’s available now on iOS and Android, and it’s a free download with just a few unintrusive, optional ads and no microtransactions whatsoever. If you’re not familiar with picross puzzles (also known as nonograms, after their creator, Non Ishida), they’re simple grid-based logic puzzles that see you filling in squares based on numbered clues in the margins, with the result being a piece of pixel art. In the case of Pixel Puzzle Collection, those pixel artworks are sprites from a wide range of classic Konami games like Gradius, Yie Ar Kung-Fu, Antarctic Adventure, Milk & Nuts, and plenty more besides. If you play with sound on, you also get to enjoy a soundtrack composed of music from those same classics. It’s a pure, unadulterated celebration of Konami’s history. This feels like an unusual (but very welcome) change of direction for Konami, a company that’s become infamous in recent years over a widely-publicised conflict with Hideo Kojima and what many see as poor handling of significant properties like Castlevania and Silent Hill. At one point, it seemed like Konami was turning its entire focus towards pachinko machines, with an annual Pro Evolution Soccer as the only reliable mark on its calendar of game releases. 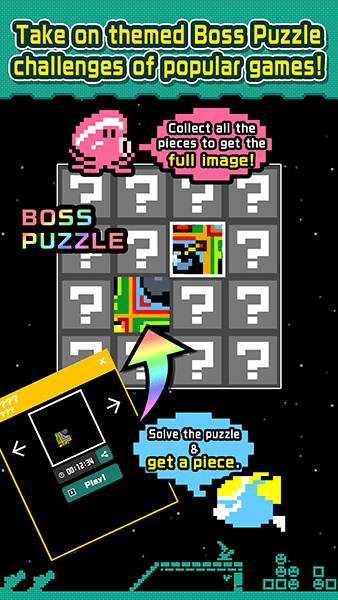 It’s also worth noting that Pixel Puzzle Collection is one of the better mobile picross games. There are hundreds of such games on the various app stores, but most suffer from awkward controls, intrusive ads and microtransactions, or poor puzzle design (in many cases, all of the above!) Pixel Puzzle Collection has no such issues, with a couple of different control options (direct touch or a virtual joypad) and puzzles that have seemingly been tested to ensure they can be solved without guesswork. And, again, there are no microtransactions whatsoever, and the only ads are those that are optional and tied to a hint system. It also has a couple of unique quirks. Rather than going through a list and completing puzzles in order, they’re randomly selected when you start a new game from a pool that seems to widen in difficulty as you complete more puzzles. I wasn’t sure about this design at first, but I’ve grown to quite like it—it adds to the fun of not knowing what the result is going to be until you finish. I’m less convinced by the time-limited “boss battle” puzzles, though; these are larger images broken down into a bunch of individual puzzles (think Mega Picross from Picross e), but you can only play one such puzzle every four hours. It’s a way of artificially lengthening a game that, with over 500 puzzles as it is, is already rather substantial. 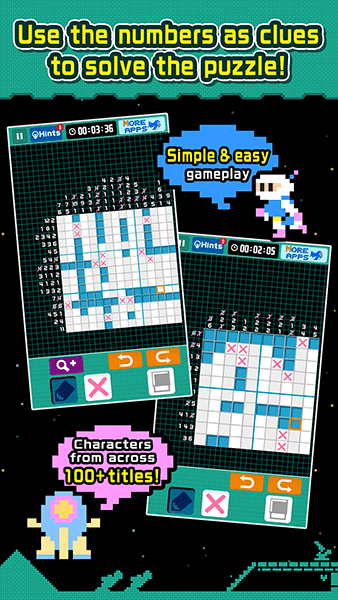 There are a couple of other minor quality of life-type issues to iron out (like the pen overwriting crosses, and vice versa, rather than skipping past them as they do in Jupiter’s games), but on balance, this is still one of the best, most well-crafted picross games available on mobile. Between this Pixel Puzzle Collection, the upcoming Castlevania Requiem, last month’s PS4 remaster of Zone of the Enders: The 2nd Runner, and a recently refreshed Suikoden web portal, it certainly looks like Konami is putting some focus on the things that, once upon a time, made it one of the most noteworthy publishers in the game industry. Let’s hope that’s the case—but if not, hey, at least we get a damn good picross game for mobile.